A layer of snow from last week’s winter storm still covers the ball fields and tennis courts at Mead Park. 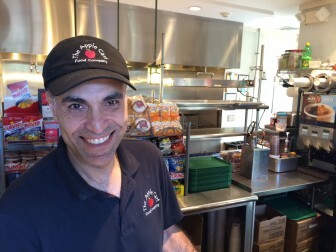 Yet with spring officially arrived and temperatures expected to soar into the high-50s on Saturday, Apple Cart Food Co. owner Emad Aziz is prepared for a rush of activity at Mead Park Lodge. He appears to have spent part of it coming up with new offerings for his customers. The expanded Apple Cart menu includes several new organic, vegan and gluten-free items—such as an organic veggie burger with avocado, lettuce, tomatoes, chickpeas, zucchini, corn, spinach, quinoa, kale and spices on a wheat bun. “One of things I love about him is that there is always something new,” said New Canaanite Tom Stadler, who taste-tested a new raspberry drink that Aziz now offers. 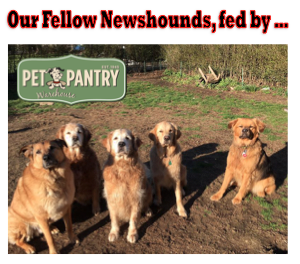 He also is offering organic peanut butter on the kids’ menu PB&J sandwich, buffalo chicken nuggets and apple fritters for breakfast and has a new cappuccino-latte-mocha bar. The prices at Mead Park Lodge haven’t changed in three years. Aziz is in the fourth year of a 5-year lease with the town. 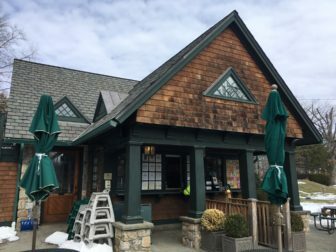 He will operate the concessions at Dunning Field, starting with an event there April 29, and he runs the concessions at Waveny Pool, Kiwanis Park, Middlesex Swimming and Tennis Club in Darien and Roxbury Swim & Tennis Club in Stamford. Great people, food and service. I wish Mr. Aziz continued success and look forward to visiting Mead Park Lodge soon. Do you have the hours the Mead Park Lodge is open? Emad’s menu is great. 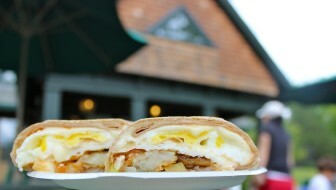 Every time I’m in New Canaan, I have to stop by Mead park for his chicken salad wrap! Top notch food and service!